We finished a busy and wonderful week of Vacation Church School last week. Our theme was “God’s World Comes Together” and we talked about our neighbors and how we are to be with them. 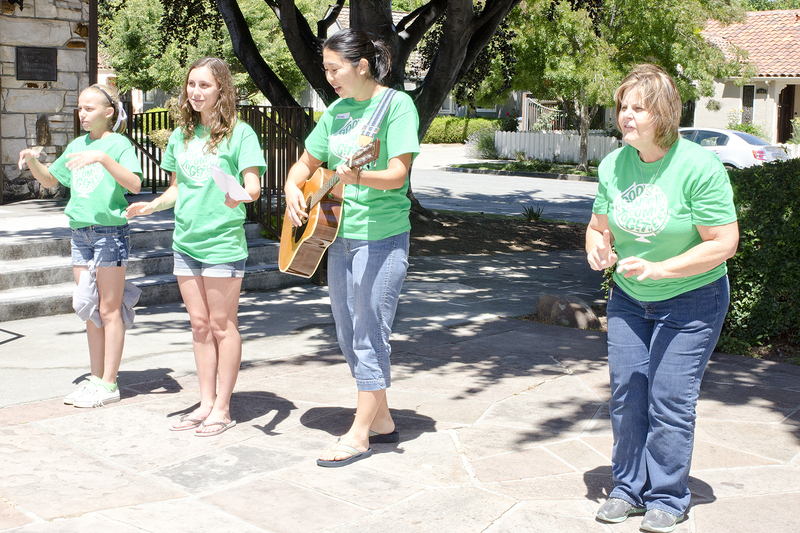 On Sunday, we had the kids come and sing and reinforced the message we learned this week. The Rev. Dr. Ken Henry (my head of staff) preached a sermon on the Good Samaritan entitled “If Only it was the Guy in the Ditch” and basically talked about how much easier it would be if the one we were supposed to love was the one who was beaten and robbed. That’s easier. But the one we are called to love in the story is the Samaritan…the outsider. The one that was the outcast. It was a good sermon. I led the prayers of the people afterward. I wanted to share that prayer… mainly as a reminder even to myself. We come and say thank you for another week in which you have held us in your hands. We want to take a moment and remember that whether we felt it or not, you have sustained us again this week. God, we do believe that you hold the whole world in your hands—but we are not naïve… we know that even as you hold it, you feel the pulse of its ache—sometimes within an individual, sometimes among nations, sometimes within the environment, sometimes where just two or three are gathered…and so as we ache, we know that you also ache for this world that you hold. God, in a world that is constantly at war and continually struggling for peace and reconciliation, it can feel like an unreachable goal or false vision to hope for a world of peace—to envision a world where all your children come together as neighbors, and live lives of peace and justice for all. And yet God, we cling to that peaceable kingdom vision, and we acknowledge the little ways in which those steps can be taken every day. Perhaps it’s through a seemingly insignificant moment, like a child this week at Vacation Church School reaching out and asking another one to be his friend—not knowing that he had never been asked that before. Maybe it’s in a small word of encouragement or a knowing glance. Maybe it’s through marching and protesting injustice with courage. Maybe our steps toward peace is through the hands of children making sandwiches right now for those who are hungry tomorrow—in the belief that they have that it matters. God, give us that belief. Teach us what it means to not only love the one in the ditch, but to love the one we don’t want to help us—the one that annoys us, the one that is the stranger, the one we cannot understand. Loving One, we thank you that you are a God who will not pass us by, but stoops to lift us up and carry us out of our pain. You love us enough to tell us stories which will shatter our complacency and send us forth to carry mercy and peace to others… help us to go forth and do likewise—and we begin following in the footsteps of the one who came bearing the good news—and who taught us to pray saying, Our Father, who art in heaven, hallowed be thy name. Thy kingdom come, thy will be done, on earth as it is in heaven. Give us this day our daily bread, and forgive us our debts, as we forgive our debtors. Lead us not into temptation, but deliver us from evil. For thine is the kingdom, and the glory, and the power forever. Amen. The two new friends at Vacation Church School.